Robert Lindgren is an Assistant Vice President and Research Analyst for the Bank Policy Institute, where he contributes to economic research on banking policy and regulation. Prior to joining BPI, Mr. Lindgren served as a research assistant at Abt Associates and Temple University and worked on education policy and microeconomic theory. Mr. Lindgren earned B.A. degrees in mathematical economics and philosophy from Temple University, where he was a Diamond Research Scholar. There is widespread consensus that bank regulations should be suited to the size and complexity of an institution. To further that objective, the Fed has indicated that it is reconsidering whether large banks that are not “Global Systemically Important Banks” (GSIBs) should be required to satisfy the full liquidity coverage ratio (LCR) requirement as opposed to the modified LCR required of medium-sized banks. We use two methods – systemic risk scores and hierarchical cluster analysis – to determine which version of the LCR is the better fit for three U.S. banks that hold over $250 billion (and therefore are currently ineligible for the modified LCR) but are not GSIBs. Our results show that the complexity of the large non-GSIBs is similar to that of the medium-sized banks, not the GSIBs, indicating that they should be subject to the modified LCR, not the full LCR. Large commercial banks and bank holding companies are required by the federal banking agencies to meet the liquidity coverage ratio (LCR). The LCR comes in two forms: The original LCR requires a bank holding company with more than $250 billion in assets or more than $10 billion in foreign exposures to hold “high-quality liquid assets” (HQLA) in an amount at least equal to the bank’s projected net cash outflows over 30 days of severe idiosyncratic and market stress. The modified LCR requires a bank with between $50 billion and $250 billion in assets and less than $10 billion in foreign exposures to maintain HQLA equal to 70 percent of its projected 30-day net cash outflow under the same stress scenario. These companies tend to have simpler balance sheets, better enabling management and supervisors to take corrective actions more quickly than is the case with an internationally active banking organization in a stressed scenario. In its final rule, the Fed opted instead simply to multiply the HQLA requirement derived under the LCR calculated with a 30 day horizon by 70 percent (21 days divided by 30 days), because it is simpler and similar to calculating the requirement at the 21-day horizon. In short, the Fed concluded that banks over $250 billion in assets were sufficiently complex that it would take a month to resolve liquidity problems at the bank while it would only take three weeks for a bank with between $50 and $250 billion in assets (“medium-sized bank”). This approach was a departure from Fed practice, which generally does not consider asset size alone a good measure of complexity. In particular, for determining how much capital or long-term debt a bank should hold, the Fed has established a multi-characteristic metric called a “systemic risk score.” There are actually two versions of the systemic risk score, one created by the Basel Committee for Bank Supervision (BCBS) and one created by the Fed. Here we use the BCBS score because all components of the score are available for all banks in our sample. The components of the BCBS score are size, interconnectedness, substitutability, complexity, and cross-jurisdictional activity. Using that metric, the Fed has defined a category of bank called a GSIB (Global Systemically Important Bank). There are eight U.S. GSIBs. There are currently three U.S.-owned large banks that are not GSIBs but have more than $250 billion in assets and so must comply with the full LCR. (We defer for future analysis foreign-owned banks and banks that must comply with the full LCR only because of significant holdings of foreign assets, as both types of banks have different liquidity and funding characteristics than traditional domestic banks.) The Fed implicitly has determined that these large non-GSIBs do not need to hold the extra capital and long-term debt required of a GSIB, but that it would take them just as long as a GSIB to resolve liquidity problems. Liquidity regulation, for example, does not have a GSIB versus non-GSIB gradation. In particular, the full liquidity coverage ratio (LCR) requirement and internal stress testing requirements of enhanced prudential standards apply to large, non-GSIB banks in the same way that they apply to GSIB banks. I believe it is time to take concrete steps toward calibrating liquidity requirements differently for large, non-G-SIBs than for GSIBs. So using the components of the systemic risk score, do the large-non-GSIBs look more like GSIBs or more like the medium-sized banks subject to the modified LCR? A simple review of the three sets of banks’ systemic risk scores strongly suggests that the large-non-GSIBs more closely resemble the medium-sized banks than GSIBs. As shown in the graph, the three large non-GSIBs sit firmly within the group of medium-sized banks. The difference between the mean systemic risk score of the three large non-GSIBs (solid line) and the medium-sized banks (dotted line) is only 19, while the difference between the large non-GSIBs and the mean GSIB score (dashed) is 248. A formal statistical analysis reaches the same conclusion: We use hierarchical cluster analysis (HCA) to test whether large non-GSIBs look more like GSIBs or more like the medium-sized banks subject to the modified LCR, on the basis of the components of their systemic risk scores. The algorithm first assigns each bank to its own cluster, then groups the two most similar clusters, then groups the two most similar clusters after that, continuing until all banks are in a single cluster. This is illustrated by the dendrogram below. 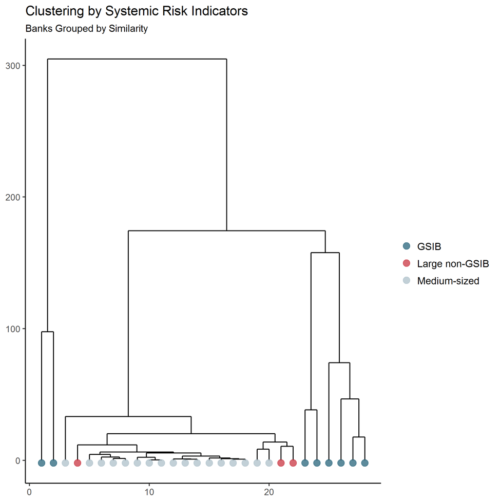 Strikingly, not only are the large-non-GSIBs more similar to the medium-sized banks than to GSIBs, as shown by both the systemic risk scores and the clustering analysis using systemic characteristics, they are not even borderline. 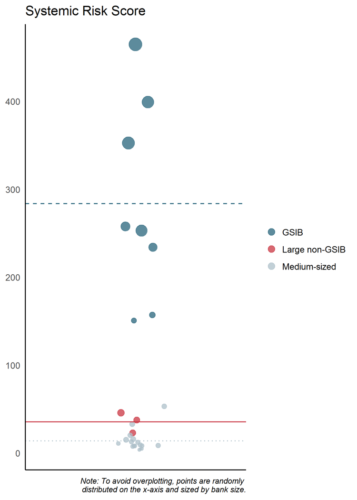 Rather, the large-non-GSIBs are well entrenched within the group of medium-sized banks subject to the modified LCR. While the large-non-GSIBs’ distance from being classified as GSIBs is notable, there is a certain circularity about evaluating the large-non-GSIBs using the characteristics used to identify GSIBs. The banks, after all, had already been classified as non-GSIBs using those characteristics. To address this concern, we also evaluate the banks using a different set of indicators chosen to identify a bank’s balance sheet and funding complexity. In particular, we use the ratios of broker-dealer assets to total assets, domestic deposits to total assets, trading assets to total assets, notional derivatives to total assets, domestic loans to total loans, and the wholesale funding ratio. As can be seen in the second dendrogram, the results are quite similar. 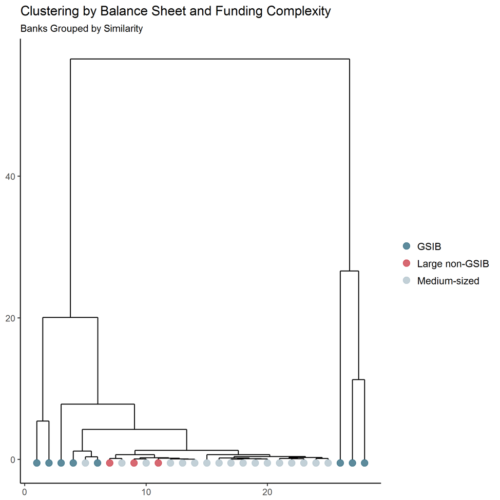 While using balance sheet and funding complexity does not produce a perfect division of GSIBs and medium-sized banks, it still shows that the large non-GSIBs are more similar to the medium-sized banks than the GSIBs. Our results strongly support the decision by the Fed to reexamine the wisdom of subjecting large-non-GSIBs to the full LCR. In its rulemaking, the Fed indicated that the modified LCR is appropriate for banks with less complex structures whose liquidity problems could be resolved more quickly. As we show, using both the internationally agreed-upon standards for complexity as well as an alternative set of measures, large-non-GSIBs are much more like the banks subject to the modified LCR than to the GSIBs. Moreover, if the Fed concludes that the LCR requirement for the large-non-GSIBs should be changed, our results indicate the requirement should be changed to the modified LCR, not to an intermediate form of the requirement. The complexity of the large-non-GSIBs is not somewhere between the complexity of the GSIBs and the medium-sized banks subject to the modified LCR, it is well within the set of medium-sized banks.